At 2:46 p.m. on March 11th when the 8.8 magnitude earthquake hit Japan, I was walking down the streets of Kamakura, an old city one hour away from Tokyo, with my sister. We didn’t notice that the ground was shaking until we passed by a 24-hour convenience store with its lights out. The lights are never out at these convenience stores, located on almost every corner of cities in Japan. We also realized that on this small shopping street, everyone had come outside onto the street with worried faces. Then, we heard the store signs squeaking and shaking loudly, and felt the ground really moving under our feet. This is not the first time for most Japanese people to experience an earthquake. But this time, the shake was strong and it kept going. “I’ve never experienced anything like this before.” An elderly woman told us, immediately after we all confirmed that the electricity wires along the street had stopped bouncing up and down. Cars running normally while streetlights are out. Photo by Fukuko Takemoto. The ground still moving occasionally with the aftershock, my sister and I decided to cut the day short and follow the crowd back to Kamakura Station. When we got there, it was already overflowing with people – students, foreign tourists, groups of elderly women, and couples who had come to visit the beautiful beaches, mountains, and temples of Kamakura. The station staff told us that the trains were not working and there were no plans for it to recover. Since we had plans to visit our grandmother in Yokohama for dinner, we decided to wait inside the train that was at the platform. With the worse case scenario in mind, we bought a bottle of water, tea, and candy. We were lucky that we found two seats inside the train. 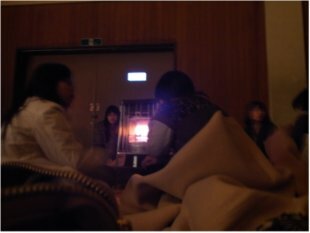 The entire Kamakura City was blacked out but there was private power generation installed at the station, so there was light and some heating in the train cars. Nevertheless, the wait in the train was long and cold, but we passengers helped each other out by sharing snacks and any new information we gained from calling our family and loved ones. 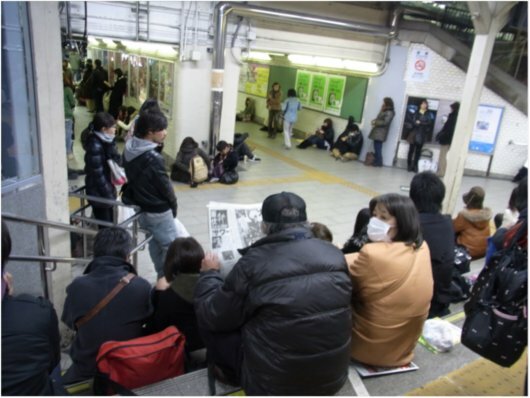 People waiting for trains to resume inside Kamakura Station. Photo by Shoko Takemoto. For a while, most cell phones were disconnected. Some were able to receive calls and text messages, but most were unable to make calls. Everyone lined up to use the public phone that was on the platform. The public phone was free of charge in response to the disaster. After waiting in line for almost an hour, I was finally able to call my grandmother’s house to find out that she and my older sister were both okay. At around 9:00 p.m., almost 5 hours after we had started waiting on the train, we got the announcement that all trains were canceled for the day and that the Kamakura City workers were leading those who need a place to stay for the night to temporary evacuation centers set up in local schools and public facilities. We said our good-byes to the people sitting around us, wishing them and their families good luck. My sister and I got off the train and lined up to call our sister and grandmother to let them know that we were not going to make it to dinner, but had a place to stay for the night. Surprisingly, when we got out of the station, the convenience store was open. 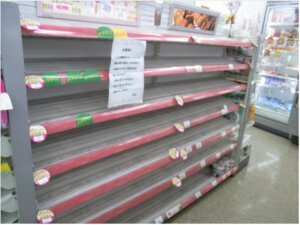 Most of the food was already gone, but we were able to buy some snacks, instant soup, and the evening newspaper. The support provided by the Kamakura City staffs was quite impressive. Many of them were waiting in front of the station to guide those who needed a place to stay for the night to the temporary facilities. 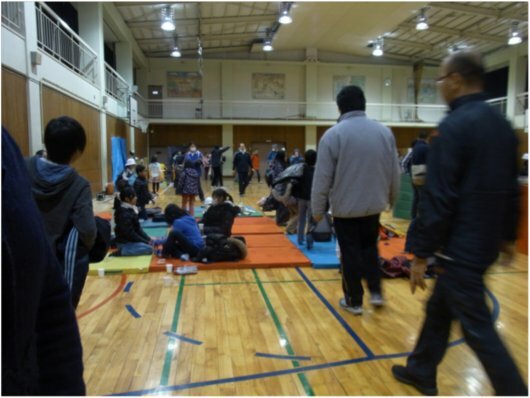 When we arrived to Kamakura Elementary School, we were kindly greeted by the city staff and led to the gymnasium. When we entered, we were surprised by how warm and spacious it was. The gymnasium had light and a kerosene stove lit up. My sister and I were able to share one gym mat to lie down on and by 10:00 p.m., blankets, water, and emergency cookies arrived. Amongst the 50 or so people staying, there was a group of elementary school children whose parents worked in the city and were unable to return home for the night. None of them were crying or looked too worried, surrounded by teachers and friends. Children waiting for their parents to return from work prepare to stay at school for the night. Photo by Shoko Takemoto. The night was quiet and calm. Some went to bed immediately after the lights went off at around 11:00 p.m., but some seemed to be texting, writing in their journals, listening to the radio, or simply staying awake. “What if we can’t go home tomorrow?” Finally having some time to think about the long eventful day, we started to slowly grasp the magnitude of what was happening. However, the brief moment of fear quickly turned into fatigue, and I fell asleep while listening to the radio on my sister’s iPod where they were announcing news updates and reading messages from those still trying to get in touch with their loved ones. Throughout the night, I was woken up several times by the aftershocks and learned that the city staff were awake all through the night. They were making rounds to make sure that everything was okay, listing to the radio for any warnings, and checking up on those who were not feeling well. After a pretty sizeable aftershock at around 4:30 a.m., I got up to see if we could catch the first train to see my grandmother and older sister. I called my older sister to have her check the status of the trains and buses. Almost everyone was up by 5:30 a.m. when the city staff person announced that all the trains should be running by 7:00 a.m.
After hearing back from my older sister that we should be able to make it back to her place, we folded our blankets, thanked the city staff, and left the elementary school at around 6:30 a.m. The city staff escorted us all the way to the front entrance, wishing us a safe trip back. 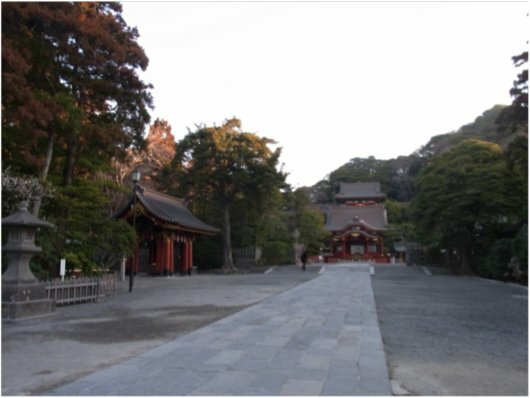 Brisk morning next day at the Tsuruoka Hachimangu shrine located next to the Kamakura Elementary School. Photo by Shoko Takemoto. When we stepped out of the school, the air was so fresh and crisp. Cars were running, joggers and walkers were taking their morning strolls, and it almost seemed as if nothing had happened. When we got to the station, we were surprised that there, too, everything seemed normal. The only noticeable difference from any other Sunday morning in Kamakura Station was that there was a station staff person announcing that the trains would be running slower and less frequently than usual, but they were back in operation. The train and buses moved safely, but smoothly, and at 8:30 a.m., 14 hours late for dinner, we finally made it to our grandmother’s house. Walking down the streets of Tokyo the day after the earthquake, there were almost no visible signs of the catastrophe that has caused so much devastation in the northwestern part of Japan. The shops are open, people are on the streets, and the trains are almost back on schedule. However, if you look closer, you notice the abnormality disguised within the routine of normality. The stores are open, but the shelves and not fully stocked; the electricity is back and the TV is on, but all the channels are reporting the devastating news of the earthquake and nuclear power plant leak; people are talking, but the conversation is about worries about those missing, the aftershock, and the scheduled black outs that will be implemented throughout the city until the spring. In disasters like this, there are thousands of stories. Overall, my personal experience immediately after the earthquake in the greater Tokyo metropolitan area has been a continuous surprise of the resiliency and preparedness of the local and national government, private sector, and the people and their communities. However, the real test for Japan’s resilience starts now. Shoko Takemoto is a masters student at the MIT Department of Urban Studies and Planning, planning to graduate in June 2011. She was in Japan during the earthquake for a job interview. Last summer, Shoko wrote a series for this site called Preparing for Disaster in the Face of Climate Change in Laos, Thailand, and Vietnam. I’ve been poring over the coverage all weekend. Your story really changed my grasp of the entire situation. The smallest descriptions made it so much more tangible, like people sharing snacks on the subway and your falling asleep to your sister’s ipod. I also appreciated how you connected the serenity of your surroundings to the local/national readiness in response to natural disasters. It’s such a contrast to some of the more recent events in Haiti, SE Asia, and the US. I wonder about the disparities in the circumstances around Japan, more specifically, which places are less vs. more ready, and whether/how income and class tie into that. I also have a question about the ethnic/racial composition of Japan, more specifically its relative homogeneity compared to places like New Orleans– whether this makes people more socially cohesive and willing to work together to prepare for natural catastrophes… or how about the fact that it was never colonized the way that Haiti or some SE Asian countries were, and that allows a certain level of economic stability? Although it’s my assumption that economic status positively correlates to natural disaster preparedness. Obviously your post has provoked a lot of thoughts for me. Thank you for sharing your experience! Thank you for sharing your story, Shoko! I saw your interview on CNN this morning and came here to read the full story. Glad you and your sister made it through without too much of a problem! Shoko, your story is so beautifully told. It really brought it all home for me–much more so then anything I have read in the New York Times. Especially all the details about what you shared with your sister as you waited, then waited some more. Shoko, thank you so much for sharing your story. It must have been a terrifying experience. As someone who is following this tragedy closely on the internet it is still difficult to fully process the magnitude of events that have transpired in Japan. My thoughts are with you and your family and the people of Japan. Shoko – you tell this story so well. Although under unfortunate circumstances, I’m glad you got to use your planning lens to analyze the public and private sector response. Best to you and all of Japan. Hi Shoko, my wife and I were in Kamakura as well when it happened. We’ve experienced minor earthquakes here in NZ but nothing like that. We also sat around at the train station wondering whether the trains would kick back into action but we ended up sleeping on the floor of the Kamakura City Hall. The city hall staff were indeed fantastic and we could not thank them enough. We bought instant noodles and snacks (I suspect from the same convenience store 🙂 and had the pleasure of sharing these and talking with other stranded tourists. We finally made it back to Tokyo when the trains started up the next day a little tired and bedraggled but safe and sound. It was certainly an interesting experience to say the least and our hearts go out to all the Japanese people affected by this event. Thank you so much for sharing your experience in Kamakura. I am glad to hear that you and your wife were taken care of by the city government officials for the night and make it back to Tokyo the next day. I hope it wasn’t too difficult to get out of the Japan after that from Narita Airport back home. With the earthquake in New Zealand being such a recent experience, you must have an interesting insight to compare the reactions and responses of people in Japan and in your country. With these natural “disasters” happening so frequently around the world, I feel that there really needs to be a better way of learning from each other. Hi Shoko, the earthquake did shorten up a holiday a bit but we didn’t leave Japan immediately since our original plan was to go to Kyoto after Tokyo. After a couple of aftershock filled days in Tokyo we headed to Kyoto but decided we wouldn’t do any day trips just in case public transport was shut down again. We had 3 wonderful (albeit shaky) days in Kyoto before flying out from Kansai. We will definitely be back though. Loved the country and the people. On the New Zealand vs Japan front the earthquake that rocked Christchurch was significantly smaller then the Tohoku one however the buildings in Christchurch were relatively old (old for New Zealand that is 🙂 so the big issue here was that many of them collapsed trapping and crushing people. The buildings in Japan are very earthquake proof and we found that out during some of the aftershocks in Tokyo – a hotel REALLY rocks when your are on 32nd floor! The real difference though was the Tsunami. In Christchurch there was no Tsunami though if there had been the damaging effects would probably have been very similar as NZ has a similar topography to Japan – several large islands with mountains in the middle. The Christchurch area is relatively flat so a Tsunami could have been pretty devastating. 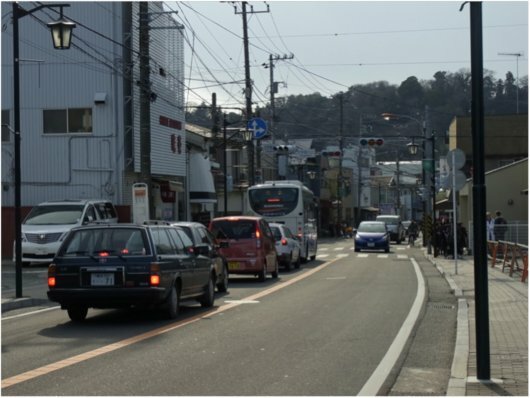 Given the building construction techniques in Japan I suspect that there would have been significantly less damage without the Tsunami. That’s definitely an area where NZ could learn a lot from Japan. Most modern buildings here are being built a lot more earthquake proof though I think we could certainly improve further.